“Regrets are the realm of humanity, capitaine, not of machines.” (Kindle Location 3331). The crew of the Antigone’s Wrath is almost all new, all with deep seated hate for the Brotherhood. All who are left are the Captain Rachel Sterling, Danton the Master at Arms, and one other sailor. To pick up this story, Rachel will need to get help from Silas Jensen again. It isn’t for her that she needs Silas, or is it? Captain Rachel Sterling was as strong as ever in this second book, but she doesn’t always know herself. I love the way she was commanding as a leader, a true pirate, and able to use every resource available to her to get what she wanted (even wearing a corset!). This is a steampunk story that doesn’t throw difficult language in your face or too much in the way technically/scientifically. This is a steampunk story for everybody. 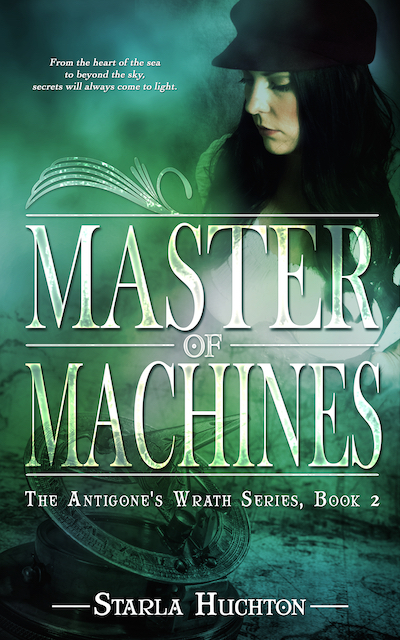 It truly has a story because the Antigone’s Wrath must race time to get what they want and there are plenty of obstacles in the way! I appreciated how Huchton acknowledges the shortcomings of the culture while still staying true to the world that we’re familiar with and showing an ideal female role model and how we would like our world to be even if it is not. For example, Captain Sterling says, “The world is filled with misogyny. I find it’s more useful to appreciate and reward kindness than acknowledge and battle every insult.” (Kindle Locations 898-899). This novel was published by Amazon Digital Services, Inc. on February 16th, 2016 and is available on Amazon here.